This week our pastor, Joe Hishmeh, continued our discipleship series, “Ephesians – United in Christ.” In his message for the weekend, Joe shared from Ephesians 4:1-16 about unity in the Church. Unity, Joe said, is a sign of Christian maturity and is life-giving for the believer. It was a powerful reminder of the value of unity for our lives and for Christ’s mission for the Church. You can listen to or watch the entire message and service here. For our singing this week, we focused on . “Your Grace Is Enough” – We opened with this song because it is both familiar and it reminds us of the all-sufficient grace we have in Jesus. Our standing with God is not by our own merit, but because of His grace toward us. “Song of the Redeemed”– This was a new song for our congregation this weekend, even though it’s not really new at all. I love the concept of the “song of the redeemed” throughout Scripture–the song that can only be sung by those who have been redeemed and rescued by God. It shows up in Exodus with Moses’ song, throughout the Psalms, and all the way to the book of Revelation, where the redeemed are gathered around the throne in worship in 14:3. Angels cannot sing this song; only those who have been redeemed can sing of God’s redemption. “You Have Overcome” – We sang this song because it helps us worship by clearly focusing on the gospel: we were dead and lost, but Jesus went to the cross in our place and bore the righteous wrath that we deserved from God, and then Jesus rose from the grave in victory over sin and death. Jesus has overcome, and there is no one else who can save us! It is overwhelming to see the church sing it as well as they do. There is nothing more powerful or motivating for worship than the gospel. “Lord of All”/”How Great Is Our God” – We wrapped up the first section of our singing with this sort of medley. First, we sang “Lord of All” which is one of our church’s favorite songs (which makes me very happy), and then we tagged the chorus and bridge of “How Great Is Our God” to finish up. It was a beautiful moment of exalting God together. “Center” – This was our response song this weekend, as it is a significant prayer for us to sing to our God: “O Christ, be the center of our lives/ Be the place we fix our eyes/ Be the center of our lives.” If we all truly desire for Christ to be the center of our lives, we will be unified. This weekend was a great weekend of worship! Our team did a great job, and it was a blessing to worship with our congregation. I think the highlight for me was singing “You Have Overcome” and moving right into “Lord of All”/”How Great Is Our God.” It was really powerful and moving as we simply lifted up our Savior for who He is and what He has done. I love our church! On Sunday morning, we also had a special guest musician playing before our services: Joe Gavin. Joe is a friend of mine from Lakeland, FL, and he is an incredible fingerstyle guitarist. He has taught me a lot, and it is always a joy to hear him play. He was in town to play for the Trash Mountain Project’s Spoken benefit, and he was kind enough to play for us as well. It was a beautiful addition to the day, and contributed in a great way. If you want to hear more of Joe’s music, his website is joegavin.info, and you can find his CD/MP3s on iTunes and on Amazon. Support his great work! This week our lead pastor, Joe Hishmeh, kicked off our new discipleship series, “Ephesians – United in Christ.” In his message, Joe shared from Ephesians 1:1-14 that Jesus is our best offense, our best defense, and our best confidence. It was a great reminder of the work of Christ on our behalf, which results in grace and peace in our lives. He is so good to us! You can listen to or watch the entire message and service here. For our singing this week, we focused on the gospel and on God’s sovereign power over all. “In Tenderness” – This was a new song that we taught during our countdown last week, and continued teaching this week. It is a hymn that was written in 1894, and that was rearranged by a band from Mars Hill Church called Citizens. I love the energy this song brings to our services and to our congregation, and I think our church is catching on. I think this song is a keeper for us, and it fit well with the message for this week. “Glorious Day” – This is another old hymn that has been refreshed for the Church today by Village Church. I love the lyric of this song, as it remembers where we were before Christ, and then celebrates what Christ has accomplished–and will accomplish–for us. It is a great fit for this series through Ephesians. “You Alone Can Rescue” – This song focused specifically on the redemption that we have in Christ. I love how this song communicates our own powerlessness to save ourselves and the unique ability of Christ alone to rescue us from sin and death. Because of who He is and what He has done for us, He alone is worthy of our praise. “Lord of All” – We went from singing about the unique worth of Christ (because He is the only one who can rescue us) at the end of “You Alone Can Rescue” to this song, which emphasizes His unique worth because He is the Lord of all. This has been, and remains, one of our church’s favorite songs. I love singing it together. “Son of God” – We responded to Joe’s message with this song, which focuses on the unique personhood of Jesus. This is another of our church’s favorites, and it was a great way to wrap up our services. This weekend was a solid weekend of worshiping together. Our team did a great job leading our congregation in singing to our King. 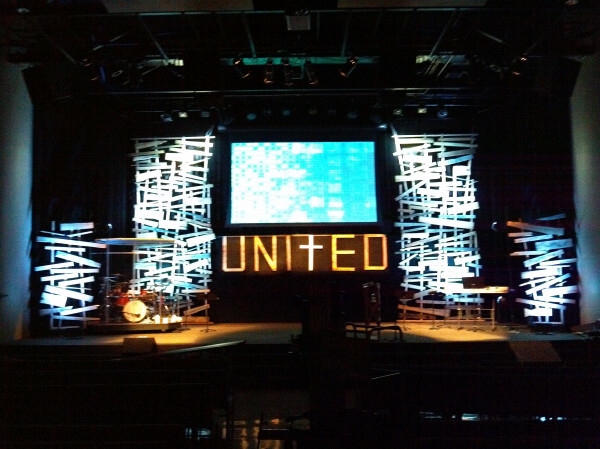 We also worked like crazy to get our new stage design put together, and I am really happy with how it all turned out. I am really excited about going through Ephesians together as a church. It’s going to be transformational!